We acquired the 183-mile NEJD CO2 pipeline that runs from Jackson Dome to near Donaldsonville, Louisiana, as part of the 2001 acquisition of our Jackson Dome CO2 source. Since 2001, we have acquired or constructed over 750 miles of CO2 pipelines, and as of December 31, 2017, we have access to nearly 950 miles of CO2 pipelines, which gives us the ability to deliver CO2 throughout the Gulf Coast region. 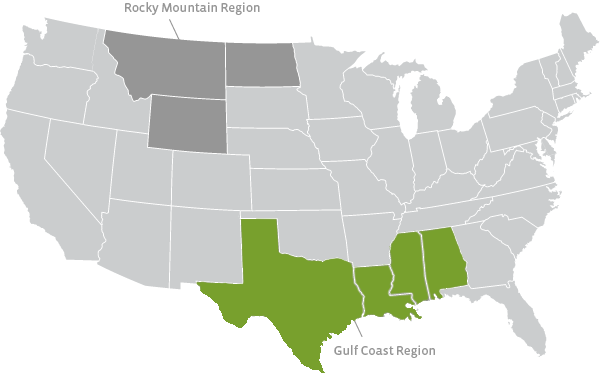 In addition to the NEJD CO2 pipeline, the major pipelines in the Gulf Coast region are the Free State Pipeline (90 miles), the Delta Pipeline (110 miles), the Green Pipeline Texas (120 miles), and the Green Pipeline Louisiana (200 miles). Completion of the Green Pipeline allowed for the first CO2 injection into Hastings Field, located near Houston, Texas, in 2010, and gives us the ability to deliver CO2 to oil fields all along the Gulf Coast from Baton Rouge, Louisiana, to Alvin, Texas. At the present time, most of the CO2 flowing in the Green Pipeline is delivered from the Jackson Dome area, but also includes the CO2 we are receiving from the industrial facilities in Port Arthur, Texas and Geismar, Louisiana, and we are currently transporting a third party’s CO2 for a fee to the sales point at Hastings Field. We expect the volume of CO2 transported through the Green Pipeline to increase in future years as we develop our inventory of CO2 EOR projects in this area. Green Pipeline. Construction of the Green Pipeline was completed in mid-December 2010. The 320-mile pipeline runs from the end of our NEJD Pipeline near Donaldsonville, Louisiana (southeast of Baton Rouge), westward to our Hastings Field (south of Houston, Texas). NEJD Pipeline. We acquired the NEJD 183-mile CO2 Pipeline that runs from Jackson Dome to near Donaldsonville, Louisiana, as part of the 2001 acquisition of our Jackson Dome source fields. Free State Pipeline. Construction of the Free State Pipeline was completed in 2006, and it is currently transporting CO2 to our four existing tertiary fields in East Mississippi (Eucutta, Soso, Martinville and Heidelberg). Denbury has the sole and exclusive right to the entire capacity of the 86-mile Free State Pipeline under an agreement with Genesis Energy L.P.
Delta Pipeline. During 2007, we continued our expansion of our CO2 pipeline infrastructure with the completion of the first segment of our Delta Pipeline between Jackson Dome and Tinsley Field in January (31 miles), which significantly increased the transportation capacity of CO2 to that field. This line was further extended by 77 miles from Tinsley Field to Delhi Field in 2009. West Gwinville Pipeline. We have reconditioned and converted the West Gwinville Pipeline, a natural gas pipeline we acquired from Southern Natural Gas Company in 2007, to CO2 service. We are currently using the 50-mile pipeline to transport CO2 to Cranfield Field.